With the Northern Hemisphere heading into winter, we’re all soon be plagued by the interior fogging of car windows. Decades ago, I heard Tom and Ray Magliozzi divulge the secret on Car Talk. Set air intake to fresh air input instead of recirculating. Set temperature between cold and hot (neutral? tepid?). Your foggy windshield will begin clearing up immediately if the settings are right. Once it clears, you can set your car’s temperature and blowers however you like. 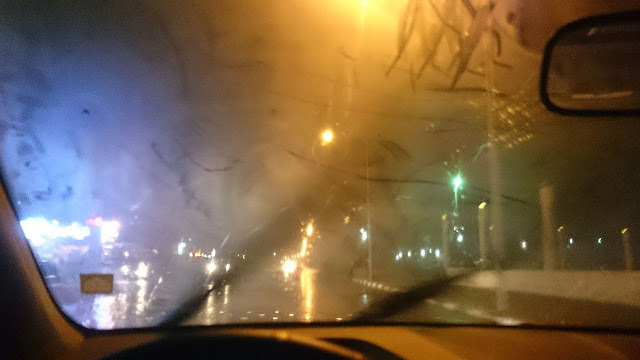 If it resumes fogging up, you still have too much humidity in your car. Return it to the settings above as needed. Sometimes things like a hot box of pizza or a lot of people in the car can generate bonus fog. Your kids will be sure to tell you that you’re doing it all wrong when you reach for the AC. Take the teachable moment and save your future self some time driver’s education time. Plus, knowing will make them safer even if they're not the driver. Stay safe! Don't forget to return your ice scraper and other winter gear to your car. ***Baby Toolkit is a compendium of randomness broadcasts from a chaotic suburban home located somewhere between the Bible belt and the Rust Belt in the great Fly-over. We are Amazon affiliates, so a small portion of purchases made through our Amazon links contribute to our general upkeep. Thanks for reading even the small print!